5 Best VPNs for Skype 2018 – What is the Best VPN for UAE Skype? Mandee Rose	● Posted on February 26, 2018 April 18, 2019 ● Leave a comment on 5 Best VPNs for Skype 2018 – What is the Best VPN for UAE Skype? Skype is one of the most popular communication and messaging apps in the world. Whether you want to send old school IMs, video call family members or work contacts, or take advantage of VoIP calls, Skype is still many people’s go-to application. Skype now has many competitors, such as Facebook’s video calling feature and other video calling knock-offs. However, back in the day, Skype was a clear leader among communications apps. It’s hard to believe, but Skype is now 14 years old, having been introduced back in 2003. It was Skype acquired by Microsoft in 2011 for a whopping $8.5 billion, and has become integrated with Microsoft accounts. These days, many people are terrified of using online communications apps that support voice and video, for fear of the wiretapping scandals brought to light by Edward Snowden. If you want to lock down Skype communications, I’d highly recommend using a good VPN service. However, beware of using a poor or slow VPN service, as this can trash the quality of Skype communications (more on this below). Before we dig into the technical aspects of Skype, let’s start by looking at the five best VPNs for Skype. The first VPN that I recommend for use with Skype is Buffered. I’m a little biased, since I prefer VPN services that aren’t based in the US, Canada, or UK due to past wiretapping scandals and FVEY surveillance. BufferedVPN is based in Hungary, and it is extremely friendly to Bittorrent users, since it permits P2P data transfers. It doesn’t log any user activities, though it does keep some metadata logs for server maintenance. I was pleased to see that it allows up to five simultaneous connections. It doesn’t have a free trial, but offers a 30-day money-back guarantee instead. BufferedVPN isn’t the cheapest service, though it is on par with ExpressVPN’s prices. An annual subscription discounts the monthly rate to $8.32, which is reasonable. It is available on all the major platforms, including Windows, Mac OS X, iOS, Android, and Linux. NordVPN is the second best option for users looking to lock down their Skype communications. One of its shiniest features is the ability to connect as many as six devices to a VPN tunnel at a single time, so it isn’t necessary to connect your router to a VPN tunnel to secure every device that connects to your network. Plus, it’s also pretty darn cheap. Though not the cheapest provider in the industry, NordVPN does only cost $5.75 per month with an annual subscription. I recommend getting the longer term subscription, since the monthly plan doesn’t offer great savings. If you’re on the fence, NordVPN generously gives users up to 30 days to get their money back, so you’ll have nearly a month to try it out risk-free. The service is great for Bittorrent downloaders since it permits P2P traffic through the VPN servers. I thought the guides were pretty good, though it might be more helpful if the images had been highlighted. NordVPN’s two main advantages are price and simultaneous connections. It doesn’t have a reputation for being one of the fastest providers, but has no trouble handling the scant amounts of bandwidth required for streaming voice and video in a Skype call, and its latency is decent. In addition, NordVPN operates servers in 57 countries, so it’s a simple matter to find a server near most geographic regions. ExpressVPN has cultivated a reputation for being one of the fastest VPN providers available. You’ll see that just about every service claims it has the “world’s fastest VPN,” and whether or not that’s true for ExpressVPN, it’s certainly faster than most other providers. As such, it’s a great choice for people who want to secure Skype transmissions. Because I’m wary of Microsoft and firms based in the US, I was pleased to see that ExpressVPN is based in the British Virgin Islands. Currently, ExpressVPN operates servers in 94 countries and 145 locations. Only a handful of other providers, such as HMA and PureVPN, can rival this. ExpressVPN allows three concurrent VPN tunnels per account, which is great if you’re the type of person who has more than one computer or mobile device (which seems to be everyone these days). There are, unfortunately, a few drawbacks. This service lacks a free trial, though it compensates that shortcoming nicely with a 30-day money-back guarantee. Also, it is more expensive than the standard run-of-the-mill service. An annual subscription costs $8.32 per month, which ExpressVPN is able to charge since it provides fast and reliable servers. At any rate, ExpressVPN has fast enough speeds to make it a great option for Skype users. Next up is VPNArea, which is another good option for Skype users. VPNArea permits P2P and Bittorrent traffic through its network, which will help hide your real IP address from other downloaders while preventing governments, ISPs, and copyright enforcers from viewing your downloads. I also love the fact that this provider is based out of Bulgaria, so users don’t have to worry about coercion from the US government to participate in wiretapping. VPNArea doesn’t log user activity either, with exception to some meager and inconsequential metadata. It does use shared IP addresses on its servers, but customers have the option of paying extra for dedicated IP addresses. In addition to allowing up to five simultaneous connections per account, I really liked VPNArea’s extra security features, such as anti-DNS leak protection, anti-IPv6 leak protection, and anti-WebRTC. Furthermore, the software client comes with a VPN kill switch for people who want to download data exclusively through the VPN tunnel. It doesn’t have a network as large as ExpressVPN, but to date VPNArea maintains servers in 60 countries. In lieu of a free trial, VPNArea has a money-back guarantee and cheap pricing. The monthly cost of an annual subscription is just $4.92. Last but not least is VyprVPN, which is our fifth best VPN for Skype. It has the advantage of being based outside the US, though there are some nuances. VyprVPN is owned by a parent company named Golden Frog, which is based out of Switzerland. Nevertheless, the firm has employees within the United States. Still, I feel more comfortable using this provider than a service that is 100% based in the US. In addition to relatively cheap pricing, VyprVPN offers industry standard server connections using L2TP, PPTP, and OpenVPN (I like OpenVPN the best because of its strong security). Also, there’s a cool little proprietary feature with VyprVPN’s OpenVPN implementation, which is called Chameleon. Basically, Chameleon hides packet header data to prevent firewalls from performing deep packet inspection on data contained in the VPN tunnel. There are a couple different packages. The premium package allows up to five concurrent connections, while all packages come with standard features like NAT firewall security and access to 64 different countries. Last but not least, note that you can get a one-year subscription for about $5.00-$6.67 a month, which is pretty darn reasonable. These days there seem to be an endless number of ways to make calls, but VoIP is still a viable alternative to using your smartphone. One of its greatest advantages is that it doesn’t eat up data or minutes on a plan with your provider. Even though many people have unlimited data and calling plans, sometimes a carrier’s signal is extremely weak. You aren’t restricted to using a carrier’s network to route your voice data. Sometimes it’s preferable to connect to WiFi with a computer or smartphone and use VoIP (Voice over Internet Protocol) to route data through the public internet instead of using a 3G or 4G network for two reasons. First of all, WiFi connections are usually faster than the connection a smartphone uses through a cell tower. In places where a phone signal is weak or non-existent, using WiFi for Skype audio or video can be a real life-saver. Second of all, using Skype for communications, as opposed to a standard call on a smartphone, allows users to lock down privacy by means of encryption. While many governments claim they don’t perform wiretapping to listen in on calls (though many of them still do), it’s fairly common for third parties to log metadata, such as call time, duration, and which contacts were called. Not only do governments harvest these types of metadata, but many providers and phone carriers do as well. I don’t know about you, but I detest the thought of someone gathering information about who I call. After all, it’s no one else’s business but mine and whomever I’m contacting! By using Skype with encryption, it’s possible to circumvent carrier networks that would log data regarding your calls. And most VPN providers have extremely favorable and innocuous logging policies. Using a VPN tunnel adds overheads to any data transmissions – and there’s no way around it. To further complicate matters, voice traffic is one of the most sensitive and demanding forms of data transmission in the world, due mostly to its real-time nature. To facilitate faster data exchanges, VoIP uses a protocol called UDP (User Datagram Protocol). However, UDP does have its limits, and latency affecting a UDP connection can turn an otherwise pleasant VoIP call into an unintelligible, garbled mess. As such, the finicky requirements of VoIP leave many users wondering how to know whether their connection is fast and stable enough to support a quality voice call. Fortunately, you don’t need to be a computer geek or whiz kid to measure a connection’s speed. Firstly, note that the industry-standard rule of thumb is that a voice call needs to have 300ms of round trip latency (RTT) before users start noticing poor call quality. There is actually a myriad of voice compression algorithms that all have their own unique requirements, but for the sake of a Skype VoIP call, use 300ms as a marker of call quality. Ideally, you’d like to have latency well under 100ms. Anything above 300ms can lead to a terrible call. So, if you want to call a friend in another country, simply ping an IP address from that country for a rough estimate of your connection’s latency through the VPN tunnel. Latency is, in part, affected by distance. Thus, generally speaking, the further away your contact is, the higher the latency will be. I would also like to point out that you should take care to connect to a VPN server hosted in the same country as your contact. For instance, let’s pretend that you live in London and want to use Skype to communicate with a contact in Germany. Ideally, you would want to connect your VPN tunnel to a server in Germany. There are two reasons for this. 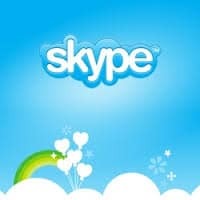 Firstly, terminating the VPN connection as close to the destination as possible reduces the number of hops that Skype data will be sent in an unencrypted state. Secondly, doing so will reduce latency and provide for a smoother connection. If you connected to a server in California, your data would then need to be routed through the VPN tunnel from London to California, and then be sent from California to Germany. That would hardly be an optimal path, and your latency would spike. Using VoIP technologies to route calls from WiFi or an Ethernet connection will circumvent the need to send voice data over your phone carrier’s network. Remember that the general rule of thumb for decent audio call quality is 300ms, and you can find your latency by using speedtest.net and selecting a server as close to the destination as possible (or by pinging an IP address from the destination). Furthermore, using a VPN tunnel in conjunction with Skype will prevent governments from eavesdropping on your call as it crosses geographic borders, since the data will be encrypted. I’d highly recommend using one of the aforementioned providers for good Skype call quality. If you aren’t sure which one would work best for you, taking advantage of the money back guarantee to test it out for yourself. Lastly, note that using a VPN tunnel will secure more than only Skype data. A VPN tunnel will also unblock geo-restricted content and encrypt internet transmissions to prevent hackers, ISPs, and third parties from snooping through your data. If you don’t want big brother watching over your shoulder as you use Skype or other internet applications, use a VPN tunnel!